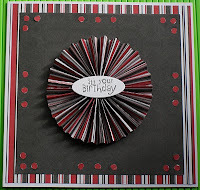 I really had to force myself to do this card so I could complete the Cowgirl Sunday Challenge #2 with blog hop. You have to collect up the numbers off the DT blogs and challenge blog then post a card using black, white and red, then e-mail the added up numbers. This challenge ends on Sunday and has run for nearly 2 weeks. I will use the excuse that I had to rush my OH into hospital 2 times with 'intense aching pains' (his words) caused by Kidney Stones (don't feel sorry for him it's payback for when I went into labour and he wouldn't get out of bed and take me to hospital, long story, maybe told another time). The first time I took him was Friday morning after the kids had gone to school and then on Monday afternoon just after the kids got home. Both times he had to stay in over night to get pain relief and have a scan to see where the stones were. He's back home now but still off work waiting for the stones to pass. Anyhoo, the paper I have used is from a DCWV 12 x 12 paper stack No. 6. 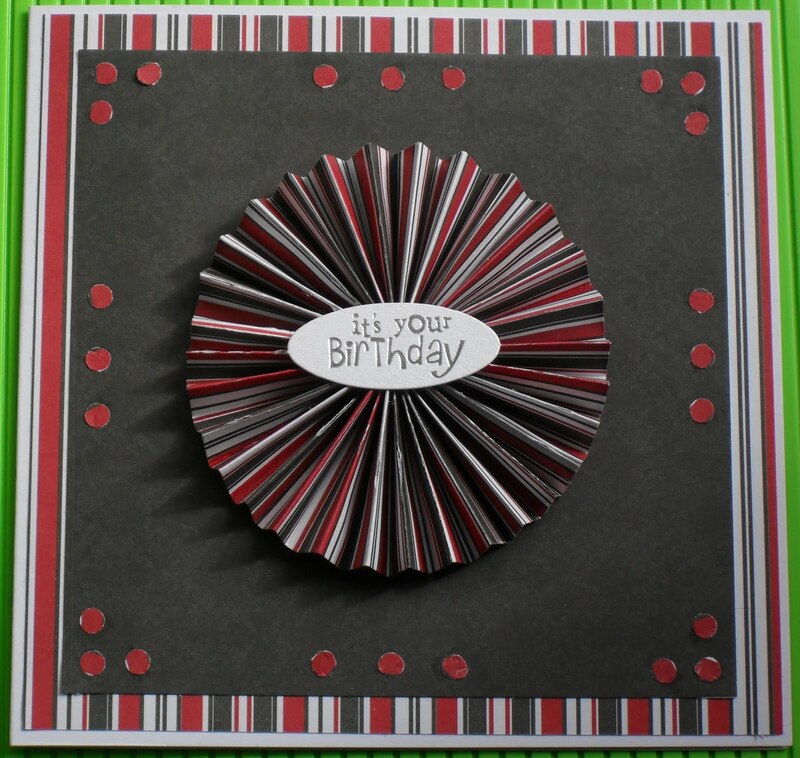 I pleated the paper to make a rosette and used a Craftwork Cards sentiment in the middle. I used my big bite to punch out the small circles and stuck them on the black layer. If I don't post again I hope everyone has a good weekend and for the people in England a good long weekend. wow Poppet this is stunning its really eyecatching i really like this technique its something i haven't done before it looks great so goodluck for the challenge huni i also have entered this challenge and thought it was a good hop too.As for your other half it sounds like he has been suffering but don't worry as soon as you said the word labour not an ounce of sympathy came from me lol you must share that story with me sometime. Thank you for taking the time to join us at Cowgirl Sunday in our Blog Hop and Challenge Poppet. Sounds like your having a stressful week, hope OH is better soon! You're card is brilliant, I love the pleated paper and it must have taken ages to place all those dots! Looks like you've got your mojo back, this is a great card, very eye catching. I love the pleated rosette, I must have a bash at that. Hope hubby is better soon, and I do think you should share the story, love to hear that! This card is gorgeous, I know what you mean about lost mojo - I'm surrounded with some really good things that I could/should be doing but theres nothing in me to do them - so I'm waiting for mine to return too! How cute! Love that pleated rosette,so neat! Men can't endure any kind of pain,bunch of wooses!!! Thank you for joining us over at CSSC..
Poppet! This is so pretty! I love the colors you used and this great fold too! Hi Poppett, sounds like you have had a busy week. Thanks for the comment you left on my coffee cream colour scheme card you did make me smile! I love this card it is very stylish!